After a very long fortnight, suffice it to say, enough with the Pennsylvania “Shockers” already. Still, at least this one’s happy. A former head of pastoral formation and vice-rector of Rome's Pontifical North American College known for a particularly strong Marian devotion and “phenomenal pastoral sense,” the bishop-elect (right) will assist Bishop David Zubik, whose celebrated all-out vigor has hit sizable stumbling blocks over recent months after the ordinary began suffering back problems that’ve seen him undergo two surgeries since last April, the last of which -- in early January -- required a month off to recover. Along those lines, like last month’s appointment of Boston’s Fr Chris Coyne as auxiliary of Indianapolis (his ordination to come next week), the unusual scenario of a choice from across diocesan lines indicates that as the local need for an auxiliary was particularly pressing -- both on account of Zubik’s health and the size of the 700,000-member Pittsburgh church -- the time needed to clear a homegrown candidate through the extensive, historically intense vetting process currently in place would have delayed the remedy’s arrival. In this context, it’s worth recalling that two Burghers who recently cleared the process (both heavily mentioned as potential Steeler Nation auxiliaries before their moves) were, instead, quickly named to dioceses of their own: Bishops Ed Burns of Juneau and Bernie Hebda of Gaylord. The diocese lost its last active auxiliary with the 2009 departure of Bishop Paul Bradley for Kalamazoo. A psychiatric nurse for a time before he entered seminary, Waltersheid was ordained in 1992 by Dattillo, who died in 2003. 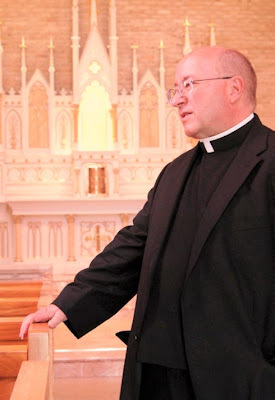 Praised for being a low-key hard worker who’s “very, very mindful” of the priests in his care, the effect hasn’t just borne fruit among the Midstate’s current presbyterate -- in 2009, the Harrisburg church welcomed an offshoot of an overcrowded discalced Carmelite community in Nebraska to take over a convent in the diocese, and the bishop-elect said last year that he expected over 100 young men to take part in a summer program to discern a possible call to priesthood. For his titular see, as opposed to some now-underwater locale or an area where the church has since been overtaken by Orthodoxy or Islam, the new Pittsburgher was notably given "California" -- the honorary jurisdiction created for the recently-passed longtime auxiliary of Los Angeles, Bishop John Ward. And, well, if California didn't go to a Californian, with the Handover of the Century afoot this weekend in LA, does that mean its auxiliaries are staying "parked"? According to the Pittsburgh chancery, the bishop-elect will be ordained on Easter Monday, 25 April. “I am profoundly humbled by my appointment as auxiliary Bishop of the Diocese of Pittsburgh by Pope Benedict XVI and I offer my heartfelt thanks to Our Holy Father for his confidence in me. I am overjoyed to have the opportunity to serve the people of God in Pittsburgh with whom already I feel a great bond. I am very excited to follow the wonderful pastoral vision of Bishop Zubik whose dedicated and effective ministry as a priest and a bishop speaks for itself,” Bishop-elect Waltersheid said. “I can sincerely say that I have loved every day of my priesthood and with now with great confidence in the mercy and love of Our Lord Jesus Christ, I humbly take the next step of embracing the good people of the Church of Pittsburgh,” Bishop-elect Waltersheid said.